Enzymatic browning of the peach fruit mesocarp is a major component of the postharvest physiological disorder commonly called chilling injury or internal breakdown (IB). Previously, we detected a major quantitative trait locus (QTL; qP-Brn5.1m) affecting browning in peach using two related progeny populations (Pop-DG and Pop-G). In this report, a gene encoding the leucoanthocanidin dioxygenase (PpLDOX) enzyme was identified as the gene potentially responsible for this QTL. PpLDOX has a high similarity with the LDOX gene of the anthocyanin biosynthesis pathway of Arabidopsis thaliana. It was co-located with qP-Brn5.1m via the bin mapping technique with the Prunus reference T×E map. A silent SNP within the PpLDOX coding sequence was used to locate the gene more precisely on the Pop-DG map and confirm its bin assignment. 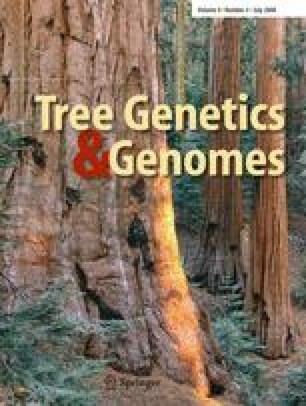 These results demonstrate both the utility of comparative mapping within Prunus using the T×E reference map and the power of the bin mapping approach for easily mapping genes in the Prunus genome. An SSR polymorphism was observed in the intron of PpLDOX gene sequence. The SSR co-segregated with the SNP and was used to assess association of PpLDOX with browning in 27 peach and nectarine cultivars. Cumulative evidence obtained indicates that PpLDOX partially explains genetic variation for cold storage browning susceptibility in peach and nectarine. This functional gene has potential use in marker-assisted breeding of new cultivars with lower IB susceptibility and for genotyping current cultivars for possible differential handling during storage to reduce symptom incidence. The assistance of David Garner for fruit quality measurements, Kevin Day for cultivar leaf sample collection, Josh Williamson, Jose Soto, Wai Gee and Helen Chan for laboratory assistance, and Drs. Howad and Arus for supplying the TxE bin-set DNA samples is gratefully acknowledged. This research was funded by UC Discovery Grants (bio03–10394 & bio05–10527) with the Industry-University Cooperative Research Program.